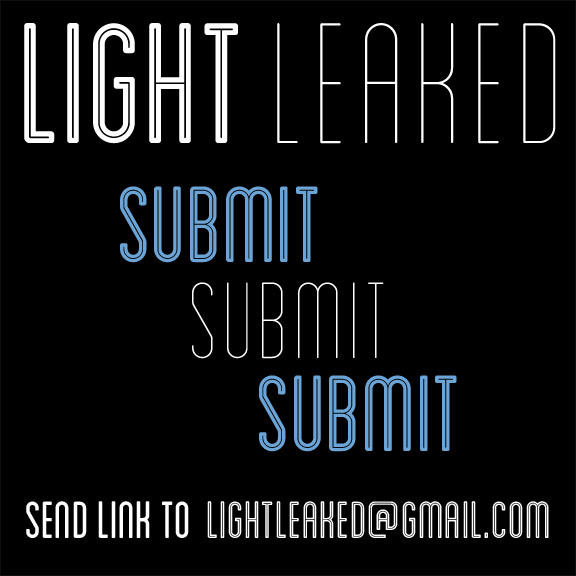 Please send an e-mail to lightleaked@gmail.com containing a link to the body of work you would like considered with the subject heading Submission. Note: Submissions will not be considered from sources other than the photographers official website. Light Leaked is interested in many forms of contributions including reviews, articles, tutorials, and interviews. Also, anything that has to do with photography! Let's collaborate! Send ideas to lightleaked@gmail.com. Q: What is Light Leaked looking for? A: All fine art photographers with a body of work are encouraged to submit. I often send feedback on the evolution of a project as well as website and marketing tools that photographers send. Light Leaked is not interested in commercial photography. Q: Why do you only accept submissions from an official website? A: This shows a professional commitment. A well designed website will help the work stand out, and also communicate what you are interested in as a photographer. A good website should tell me if you are a commercial or fine art photographer. It should be well organized and edited. I do not feature photographers with only a Flickr, Facebook or Tumblr. Q: Why did you not answer my Submission e-mail? A: Thank you for sending in a submission. I am always excited and grateful to receive them. As submissions have been on the raise, I am unable to return all e-mails. When I have time I will send feedback. Also, be aware that I often go back through months of submissions when I need to make a post. If your e-mail subject heading does not read Submission, it has probably gotten lost. Please share this post with your photographer friends and colleagues, and encourage them to submit.